Headquartered in Cork, Ireland, Carbery Food Ingredients (formally known as Carbery Milk Products) is an international producer of food ingredients, flavours, cheeses and alcohol. Operating from nine locations including Ireland, UK, USA, Brazil and Thailand, the company employs around 530 people and is committed to enriching food and drink for its diverse range of customers. Constantly seeking to improve sustainability within all areas of the company, Carbery asked Lucideon to certify its Energy Management System (EnMS) to the international energy management standard, ISO 50001. Lucideon carried out the stage 1 and 2 initial assessments at Carbery's Site in Ballineen, County Cork where a recommendation for certification was made. During the visits, areas of significant energy use were assessed. 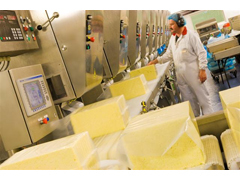 These included all of the process areas on site: CHP (combined heat and power) plant, cheese processing, food ingredients production, distillation and steam generation. During the first surveillance visit a tour of recently completed projects focusing on energy efficiency and energy saving were carried out. This included the installation of two heat exchangers, new boiler house insulation and lighting projects. By achieving ISO 50001 certification, Carbery has highlighted that it is committed to sustainable practice and continual improvement. Measuring and monitoring energy consumption will enable Carbery to use energy more efficiently which can help to both bring about cost benefits and identify alternative energy sources in order to limit future risk. ISO 50001 certification also satisfies the EU Energy Efficiency Directive S.I. 426 Article 8, Ireland's equivalent of ESOS (Energy Savings Opportunity Scheme). Tim Watts, Operations Manager, Assurance, Lucideon says: "Carbery has a well-developed EnMS which continues to identify energy projects in addition to those already delivering energy efficiency. "ISO 50001 certification has significantly helped the company to understand its own energy use and their robust and well maintained system allows for clear monitoring of performance against set energy targets and the energy baseline."